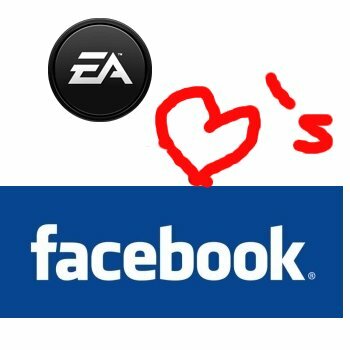 EA and Facebook Are "In a Relationship"
Electronic Arts has agreed to use Facebook Credits in all its Facebook games for five years, which Facebook reportedly "Likes." Although EA and Facebook haven't always been friends, the two mega-companies have been known to lurk on each other pages to see what the other was doing. Facebook saw that picture celebrating EA buying PlayFish in November 2009 and almost posted that "PlayFish shouldn't wear white, it makes her look fat" before thinking better of it. Then when EA realized that most people only play social games on Facebook, it figured that it should at least see what loudmouth Zynga has been talking about all this time. So EA sent a friend request, and what do you know, Facebook accepted. There followed a whirlwind romance, which culminated today with both Facebook and Electronic Arts changing their relationship status from "It's complicated" to "In a Relationship." Because of the new relationship, EA has agreed to use Facebook Credits, which can be used to virtual goods, as the currency for all of its social games for the next five years. "Since gaming has emerged as the most popular category of applications on Facebook, the natural next step is for EA to broaden its relationship with Facebook and its 500 million users," EA posted on its wall. "Our goal is to make the best games tailored specifically to the platforms on which people want to play." Not to be outdone, Facebook updated its own status: "We are pleased to enter into this long-term partnership with EA to make it easier for people to purchase virtual goods across some of the most popular games on Facebook." Both companies "Liked" the other's status updates, but failed to comment anything cute like "Good job!" or "Grats." How long do you think it will be before we start seeing profile pictures of Facebook and EA kissing each other? Is there a little one on the way?